Does writing make you wish you could draw? Maybe it’s more of a genre related thing, I don’t know but writing BirthRight is making my fingers itch to draw all the amazing characters that are zooming about in my head. It’s incredibly frustrating at times! I write/describe so much better if I can visually see what I’m describing and while I know the creatures in my head, actually clearly ‘seeing’ them is a bit more tricky. I really could do with an insanely gifted artist friend right now *sigh* Preferably one with lots of time on their hands *grin*. My fantastic friend Sian whom I’ve mentioned before is actually quite the artist but also has a pretty busy job preventing both time and inspiration for drawing. Such a bummer – I’ll have to steal one of her dragon sketches and scan it on to show you all! To try and work with this desire to ‘see’ my characters I’ve been trawling ElfWood for pictures that inspire me. I’ve also got images of actors that work for certain characters, but I’m stuck on one character. Alek, the guy who Cat falls for. He’s based on Darien from Sailor Moon which is a cartoon I love and have loved from discovering it at 12 or so. I can’t find a pic of anyone who resembles him in real life and googling ‘tall dark & handsome’ brings up lots of unwanted results. Sigh. I’ll just have to keep hunting! Have you tried DeviantArt to see if there are any artists over there willing to do a few drawings for you? There are so many amazing artists on that site. oh dear, you will just have to rely on descriptions! i have that problem too, can't draw but need the visuals!! 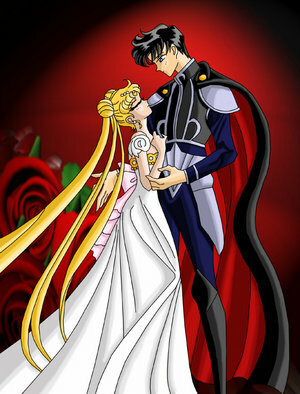 Sailor Moon <3 One of my favorite shows. Anyways, I like to draw my characters. That's how I got started with writing. I drew a bunch of characters then started coming up with stories for them. digital photography is a good substitute. Anyone can do that themselves now a days. Hi K – never! I never give up ;p Will get that darn picture. I used to draw all the time, mostly manga/anime characters, but I couldn't draw anything of my own really. It was really hard for me to draw my own characters, so I went on to writing out their details, soon those details became stories, and those stories evolved into more writing. I used to want to be an artist before I became a writer, but I can still draw even though I'm a bit rusty. Sometimes now and again, I draw, but I hardly find the time for anything nowadays. Why couldn't days be 36 hours long instead of 24? As the saying goes, "So much to do, so little time." Cool and interesting post, which reminded me of how I wanted to be an artist. As a child, I wanted to be an artist. As a teenager, I realized there were too many more talented artists, so I considered fashion design. I know what you mean. When I write, I see my characters and the scenes. I picture book covers. If I play with a picture book idea, I see the pages.